Happy Valentine’s run to me! 5 years ago, I ran my very first 10km road race. It was the Randburg Valentine’s Night Race at Randburg Harriers. My time: 87 minutes. Running through the dark streets, I was filled with emotion. I was over-whelmed at the fact that I had come so far. But a part of me was also angry because I realized that I have forgotten about the journey that I have taken to get where I am. From never having run before in my life to being able to manage running 21.1kms. It dawned on me that I am so hard on myself and so unforgiving when I don’t make a cut-off time or run as fast as I’d like to. I have stopped giving myself any credit. I have stopped being proud of my accomplishments and I’ve only focused on the goals instead of the achievements. Running the race again was much needed therapy because it reminded me that I am capable of doing this. Of running. I need to stop feeling sorry for myself and stop making excuses. Yes, I run at 8 minutes/km. You damn right I do! And I can do that for 5km, 10km and even 21.1kms straight! 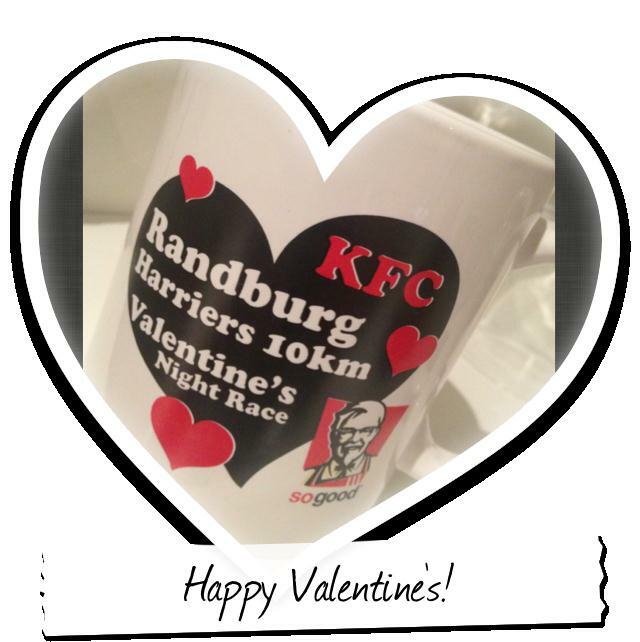 This entry was posted in My Races, My Running and tagged achievements, Happy Valentine's Day, KFC, Night race, Randburg Harriers, running by Bo. Bookmark the permalink. Love this! I see I’m not the only one hard on myself. Ps. I’m betwee 9/10minues per km 🙂 thank you for this. needed to see it. We both started running with Valentines Day runs, and we both went back and ran them this year. it was fun to look back and see what I have achieved. You must remember you are only ever competing against yourself. So if you are lazy you drop yourself. But you know when you give it all. And that is what matters. Only you can ever answer that question. Be proud of what you have achieved.